Global energy consumption will increase rapidly in the next decades. The discrepancy between demand and supply is worrisome within the old and new cores of the world-economy. Sub-Saharan Africa meanwhile possesses vast potential for energy resources to be further exploited. Whilst the Global North is a traditional player in the sub-Saharan energy sector, new actors from emerging economies - especially China’s state-owned enterprises but also Brazilian, Indian and South African giants - have entered what appears to be a scramble for the largely untapped energy resources of the region. 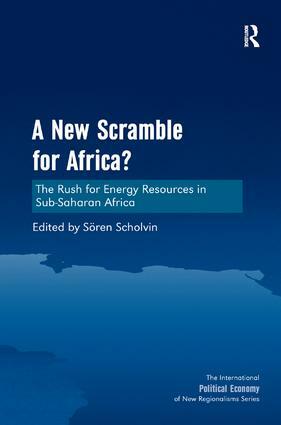 This book is the first to bring together comparative perspectives on: Â· The strategies of state and non-state actors involved in the exploitation of sub-Saharan energy resources. Â· The potential and pitfalls of new forms of cooperation on energy southwards of the Sahara. Â· The domestic opportunities and challenges of the present energy resource boom. Dynamics on the international level are brought together with local developments to provide up-to-date insights on the scramble for energy resources in sub-Saharan Africa. This book also advances a materialist approach applicable in geographical and political-scientific research, showing that much insight can be gained by concentrating on the material environment that shapes economic and political phenomena. SÃ¶ren Scholvin (PhD, University of Hamburg) is a research fellow at the Institute of Economic and Cultural Geography at the University of Hanover. He is also an associate research fellow at the German Institute of Global and Area Studies, Hamburg. He has published The Geopolitics of Regional Power: Geography, Economics and Politics in Southern Africa in the same series as this edited volume. SÃ¶ren’s research is focussed on the geopolitics of emerging powers, and regional cooperation on energy and transport in sub-Saharan Africa and South America.